Killingly Grange #112 will host its annual BIG-little Apple Festival and Cabaret. This 5th annual event will take place on Saturday, Oct. 13, at the Grange Hall on the corner of Route 101 and Dog Hill Road from 11:30 a.m. to 7:45 p.m. This is a rain or shine event. The Apple Festival/Cabaret will feature live acoustic music throughout the afternoon. This year, a yankee pot roast dinner with all the fixin's and home-made apple pie topped with Farmer's Cow ice cream will take place. Cost is $15 per person and 12 years or younger attend for $8. Tim 'n' Vicki will again perform renaissance, baroque, American folk, bluegrass, gospel and contemporary original music. During dinner, from 4:15 to 7:15 p.m.,The Usual Suspects will perform American roots, rock and roll from the '50s and '70s and early country music. Apple sauerkraut hot dogs and chili dogs, apple-based desserts, cider donuts, candy apples, apple cider and coffee will be available for purchase all day long. The Grange's 'Salon de McIntosh' novelty shop will include fine handmade items such as linens, quilted goods, photography and greeting cards, signs, and primitives. Other artisans and vendors will be selling fruit butters, jams and jellies, pickles and relishes, honey, pulla bread, fudge, candles, wooden toys, lamps and clocks, knitted hats, goat milk soaps, balms, antiques, vintage and Christmas items. Also available for purchase will be pumpkins, gourds, chrysanthemums and a variety of eating apples. There will be raffle items and door prizes. Admission and parking are free. 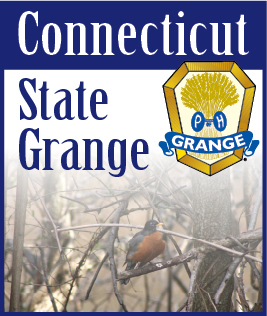 Visit www.facebook.com/killinglygrange or call John at 860-705-3643 for more information.